A new sci-fi film has been added to the Produced & Published section. 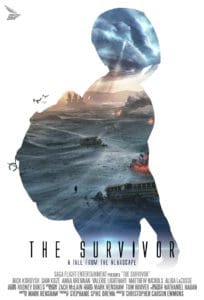 The Survivor: A Tale From The Nearscape, is the third short film written and produced by Mark Renshaw in collaboration with director Christopher Carson Emmons, Producer Tom Hoover and Al Lougher. Launched online on August the 16th, the Survivor has already knocked up some awards, winning Best Sci Fi at and both the Top Shorts and Festigious film festivals. The filmcan be viewed on Vimeo and YouTube. For more information and updates, check out the official website and Facebook page.